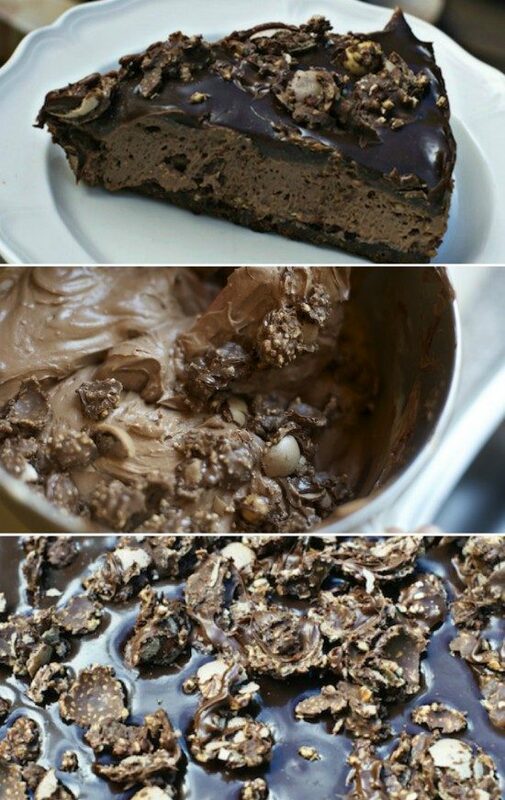 It’s the ultimate Nutella Cheesecake No Bake Recipe and you will not want to miss it! This is heaven on a plate and absolutely won’t disappoint! 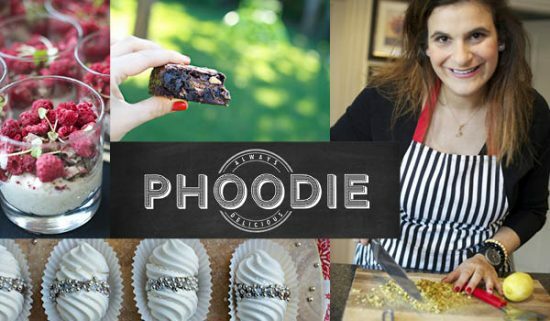 Phoodie is a favorite recipe contributor here at The WHOot and with very good reason! 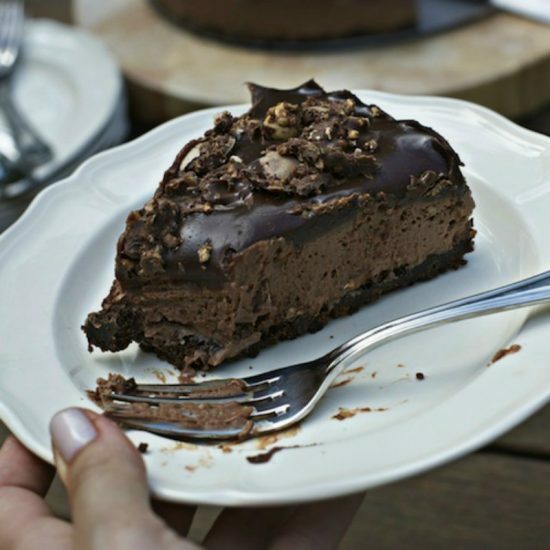 Her desserts are always winners and this Nutella Cheesecake No Bake Recipe is no different! 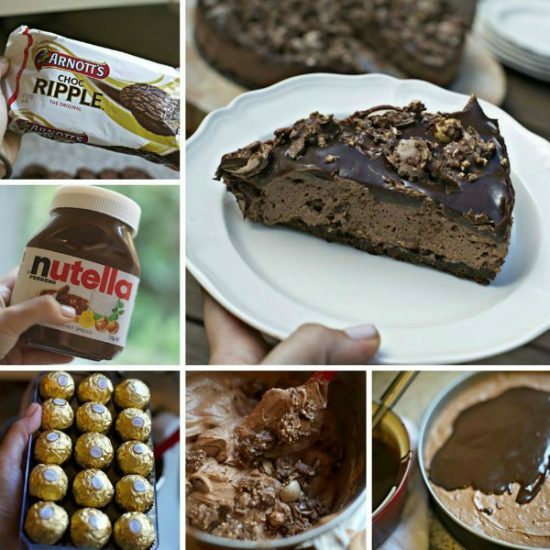 Sprinkled with all sorts of goodies including Ferrero Rochers, this Nutella Cheesecake is another cracker you’ll adore. 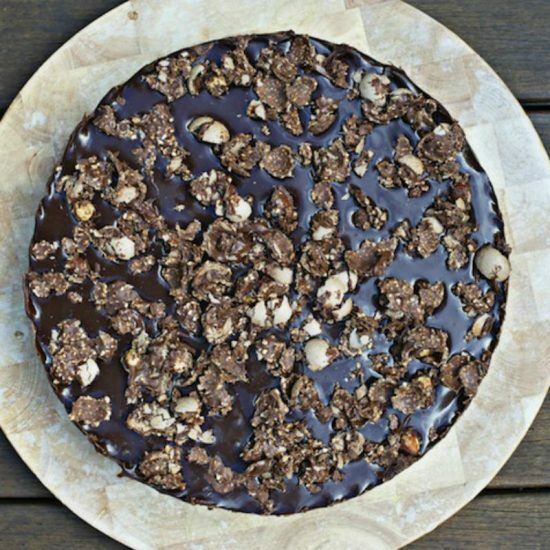 This cheesecake is loaded with melted milk chocolate and the chocolate ripple biscuit base gives it the perfect crunch. You can easily substitute with your favorite chocolate cookie. There’s a reason that this simple and delicious recipe gets rave reviews. It will be a new fave in your family. 1) Crush biscuits to a sand-like consistency either in a food processor or in a bowl / on the bench with a rolling pin. 2) Place crushed biscuits into a bowl (if not in one already) and add melted butter. Mix well and transfer to 23cm springform tin. 3) Press evenly into the base of the tin, not up the sides. Place this in the fridge. 4) In an electric mixer combine your Nutella and sifted icing sugar. When 90% combined, add your softened / room temp cream cheese and combine at high speed. 5) When this is all completely combined, add in cream and mix on high speed. It will become rather pale in color and mousse-like in texture. 6) Chop 10 of the Ferrero’s into large pieces and on a slow speed add these to the cheesecake mixture. Mix for about 15 seconds only as you don’t want them to completely turn to dust. 7) Transfer cheesecake filling to tin, making sure to spread it evenly, (see pic below) and place in fridge overnight. 8) The next day, place the chocolate and the cream into a pot on the stove and melt over a medium heat, stirring the ENTIRE time. Once combined, remove from heat, allow to cool slightly and then spoon evenly over the top of the cheesecake. You only want this later to be about 4mm thick so you may not need all of the ganache. If you do this slowly you can control the thickness of this layer better! I often end up with spare and serve it heated on the side of each slice. 9) Scatter the remaining 10 (chopped) Ferreros on top of the ganache and then place cheesecake straight back in the fridge for at least 3 hours.